Can’t make our next event? Come to the shop, where you’ll always find many more flavors than we can take on the road, along with fragile favorites like Vietnamese Coffee that don’t like being outside in the sun! We’re in the Eastworks building in Easthampton (116 Pleasant Street) across from Riff’s Joint. Grab a pop before you wait in line at the RMV, escape from Puzzled, or play games at Prodigy downstairs. SPECIAL EVENTS: Did you know Crooked Stick Pops can provide amazing frozen treats for your wedding, office party, or fundraiser? 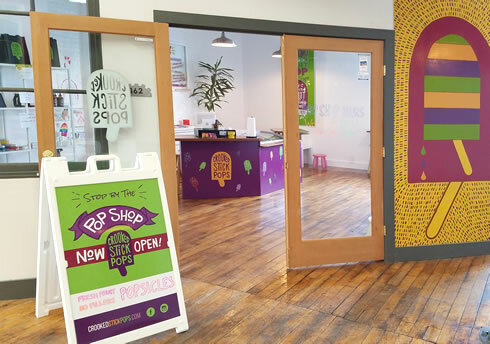 The Pop Shop is OPEN!